The Helderberg 4x4 trail is just 7 km from Somerset West outside Cape Town, featuring an easy and enjoyable route for amateurs and skilful drivers alike. Drivers will start at the Helderberg Farm and obtain the necessary permits at the tea garden. The route is about 12 km long and well marked. Graded 3 to 4, you can avoid and skip certain obstacles/routes that will bring it down to grade 2. This is a great weekend-away route to enjoy. Note that the route can get tricky in wet conditions. 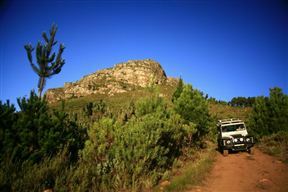 Helderberg 4x4 is 3.9km from the centre of Helderberg , the nearest airport 26.9km (Cape Town International Airport).